FOR 65-year-old retiree Balan, who had spent more than 30 years working in the aviation industry, staying at home without a job was a dreadful experience. “I felt like I had no purpose, having been working in a fast-paced environment all these years. I did not feel I was getting older, but once I started staying at home, I felt old for the first time, and I did not like it. “I recently got a job on a one-year contract with a property development firm to manage their security services. My employers told me they prefer hiring a senior person as they feel seniors are more dedicated to their jobs, [and] things like punctuality and such. I was happy to hear this as I want to work as long as I am able to, but there is always a nagging doubt that I could be easily replaced by a younger person once my contract is up for renewal,” he says. Many Malaysians aged 60 and above are probably familiar with Balan’s situation. 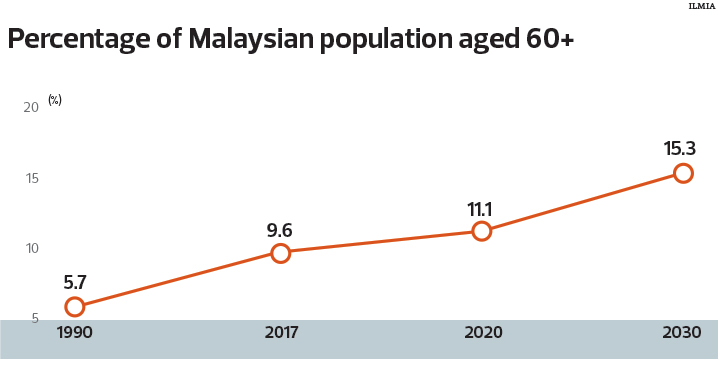 By 2020, around 11.1% or one in 10 Malaysians will be 60 and above. This percentage will rise to 15.3% by 2030, according to a recent study by the Institute of Labour Market Information and Analysis (ILMIA). Last month, Human Resources Minister M Kula Segaran urged employers to hire those over 60 as their talents and experience should not go to waste because they still have much to contribute. In order to do this, Socio-Economic Research Centre executive director Lee Heng Guie says there needs to be a radical change in the way institutions and organisations handle the ageing workforce. “This means a rethinking of public policies and business practices to develop an age-friendly human resource (HR) system to facilitate the participation of older workers. “Older persons have knowledge, experience and insights that are valuable to the organisation in terms of reliability, institutional know-how, and commitment. Not only are they thinkers and problem-solvers, but they also serve as mentors and role models to the younger generation, bringing synergy to the diverse age groups in the organisation,” he says. Will hiring the elderly aggravate youth unemployment? It is arguable that retaining older workers might deprive the younger generation of job opportunities despite inconclusive facts. The basis for that argument more than likely reflects the perceived high level of youth unemployment in the country. In 2017, the youth unemployment rate was 10.8%, which is three times the national average of 3.4%. However, ILMIA adviser Lee Chee Sung pointed out that this is beyond an anomaly. “There is always the statement that youth unemployment is high, but youth unemployment has been three times the national average for the past 15 years, and this is in line with most countries. This is because youths lack the experience, some of them are picky in jobs and some of them probably do not have the right qualifications. “What is more worrying is [the percentage] of youth that have been unemployed for a long time — long-term youth unemployment, that is what we need to worry about. But based on the statistics we have seen, the long-term unemployment rate is at a manageable level. “So, if you ask me, if hiring older workers would pose a problem for youths to secure jobs, I would say no because it [what we are currently seeing] is the natural rate of youth unemployment,” he explains. Sunway University Business School professor of economics Dr Yeah Kim Leng raises the substitute or complementary effect. “The substitute effect comes into play when older workers possess the same skills as their younger counterparts but are demanding higher pay. Staff costs for an organisation would rise. “On the flip side, the results are complementary in an organisation, which is in the midst of an expansion. Retaining older workers in the managerial level creates more employment opportunities at the entry level for youth” he says. Meanwhile, the dearth of qualified and experienced middle-aged personnel to fill top as well as highly technical positions — a phenomenon akin to a “hollow middle” commonly found in the organisation structure of many high-growth firms — is a key factor for retaining talents that have reached retirement age, he adds. Should the retirement age be increased? Reuters reported last week that Singapore, the world’s second fastest ageing society after South Korea, is looking to increase its retirement age. Singapore’s retirement age is 62 years old while companies are required by law to offer eligible employees the option of continuing to work until they reach the age of 67. Malaysia’s retirement age is at 60, but some quarters have called for it to be raised to 65. Lee says there are merits to raising the retirement age, such as helping senior citizens to build up their savings — according to the central bank, only 4 in 10 Malaysians are financially ready for retirement — so that they can retire comfortably. That said, a huge concern also revolves around Malaysia’s 1.6 million civil servants whose ever rising wage and pension payments are an albatross around the government’s neck. Putrajaya has yet to find a solution to managing the extreme bloat and the fiscal consequences are increasingly coming at the expense of the country’s development. However, before even thinking of raising the retirement age, the public sector wage bill has to be contained, Lee observed. “The government can consider right-sizing the public sector through a rationalisation of the processes and systems via ICT applications to create lean and user-centric public delivery services. As for the private sector, he said employers would want flexibility in the HR management of older workers while taking into consideration staff costs, EPF contributions, and medical expenses. “Some companies and organisations have extended their experienced staff on a contract basis post the mandatory retirement age of 60. Instead of retiring at say 63 or 65, one can consider continued employment beyond 60 on a voluntary basis,” he says. For Malaysians, given the rise in life expectancy, coupled with inadequate savings, Yeah believes it is timely for the government to consider providing more incentives to help private sector employers to lower the cost of re-hiring workers who wish to work past the mandatory retirement age. Besides lower EPF contributions for those aged 60 and above, these incentives can include double deduction tax incentives on salaries, and other benefits such as medical, he says. Are there jobs for seniors? Former employees of Accenture, Sharmila Sinnathurai and Jasmin Amirul Ghani, who set up Hire.Seniors, a social enterprise that specialises in helping seniors to find employment believe there are abundant job opportunities. “Looking at our own parents and relatives, we realised the importance of ensuring senior minds are kept active. Hence, we explored ideas to best do this, and employment came up as one of the ideas we thought could be achievable,” says Sharmila. Operating for 1½ years, Hire.Seniors charges employers a small fee to post jobs specifically for seniors. The jobs are then shared via direct channels as well as partners, but seniors can register their details with Hire. Seniors at no charge. “The jobs that appear rather often from employers tend to include roles for administrative and clerical, customer service, payroll, finance, accounting, tutors, and part time drivers for children. “From our experience, many seniors tend to prefer part-time jobs with flexible hours that are located closer to home or offer the ability to work from home. However, we have also seen recently, many seniors who are willing to apply for jobs that are full time and some are even willing to relocate to other states in order to gain employment,” says Jasmin. Employers have shared that their initial apprehension in hiring seniors boiled down to IT savviness. “However, they have also said that with patience and dedication, the seniors have been able to learn new skills and contribute effectively to the organisation,” says Sharmila. Sharmila and Jasmin believe the government’s push to hire workers above the age of 60 is timely given that seniors today are living longer, healthier lives thanks to more advanced healthcare.